Michael De Young, with his brother Charles, founded the Daily Dramatic Chronicle in 1865, which is today's San Francisco Chronicle. It is said that they followed behind pro-union rioters, who went through the City destroying the printing operations of pro-Confederacy newspapers after Lincoln's assassination in April, 1865, and picked up the metal type and printing equipment to start their paper. The Chronicle was essentially a blackmail sheet, and became enormously popular because of it. The paper was not known as a source of news or truth for much of its existence. In 1878 brother Charles engaged in a war of words with mayoral candidate and Baptist preacher Isaac Kalloch (aka the "Sorrel Stallion"), impugning his character for his purported sexual exploits. Kalloch responded as one might expect, characterizing the De Youngs' mother as a whore. Charles De Young then approached Kalloch on the steps of his church and shot him. 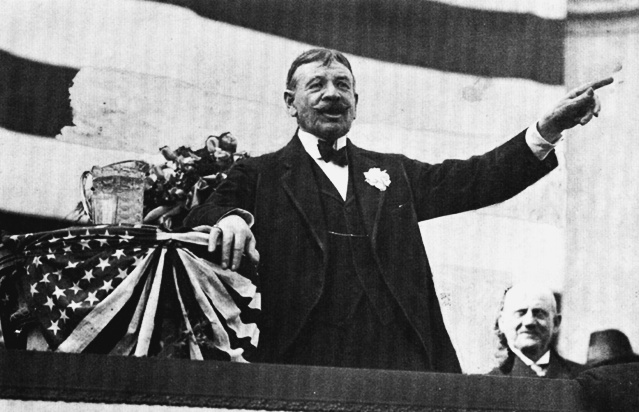 Kalloch survived the attack and was elected in a landslide ten days later. Two years later, Kalloch's son, overwhelmed by the incessant public denigration heaped on his father and the unsettled shame of the original shooting, entered the offices of the Chronicle and murdered Charles De Young. A jury later acquitted him, finding his killing of De Young a reasonable response to De Young's behavior! Adolph Spreckels, the elder son of patriarch and sugar baron Claus Spreckels, enraged by Chronicle allegations that his family sugar company defrauded shareholders, leaned out of taxi and shot Michael De Young in front of the Chronicle building in 1884. He was acquitted by a jury who accepted his plea of "temporary insanity," showing again that San Francisco juries were not fond of the De Youngs. 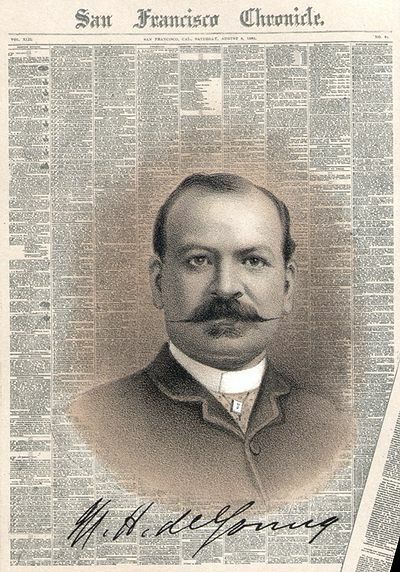 By the early 1890s, Michael De Young had built the paper into one of the city's leading dailies and was engaged in bitter competition with the Hearst-owned Examiner and the Spreckels-owned Call. Each paper freely published dirt on the families who owned the competing papers. Michael lived into the 1920s and founded a dynasty which is still very much with us. It controlled the SF Chronicle and much else besides until the family sold it all to the Hearst corporation in 1999. He used the paper, as all the families did at that time, for his own ends, in this case to launch his family into the center of San Francisco's aristocracy, the ancien regime. Which was difficult because he was at least half Jewish, and you couldn't get into San Francisco WASP aristocracy at that time with that kind of baggage. His daughters were sent to French convents while he converted to Catholicism and had himself buried in the Catholic Holy Cross Cemetery in Colma. He used the Chronicle to get up in society, and he was utterly shameless about it which makes wonderful reading if you go back to the original copies. For example, in 1894 he sponsored the Midwinter Exposition in Golden Gate Park. He sets aside the front page to a picture of him dedicating the new De Young Museum, and to an inset of his portrait. The whole front page is taken up, glorifying himself. Michael DeYoung and his wife produced five children. Charles DeYoung, their only son, died early while out fishing. So the De Young name dies out. Unlike the Hearsts, there are no De Youngs, but there are branches, because the four daughters provide the children coming down. Tung De Young married Joseph Tobin, a descendent of the founder of the Hibernia Bank, the largest bank in San Francisco. Mimi Young married Theriot, a French aristocrat, and that comes down and Charles De Young married Barbara Tobin, and comes down this side. And what do we have here? John Parot... and more Tobins... there's a whole slew of Hillsborough families, including Christian Geens, who own Stauffer Chemicals for example, various others. This is ranching, real estate, industry, banking, virtually everything you can name, tied in with the De Young family, which explains a great deal about certain editorial policies. --from a talk given by Gray Brechin at New College of California, fall 1994 and with some additions by Chris Carlsson, 2014.